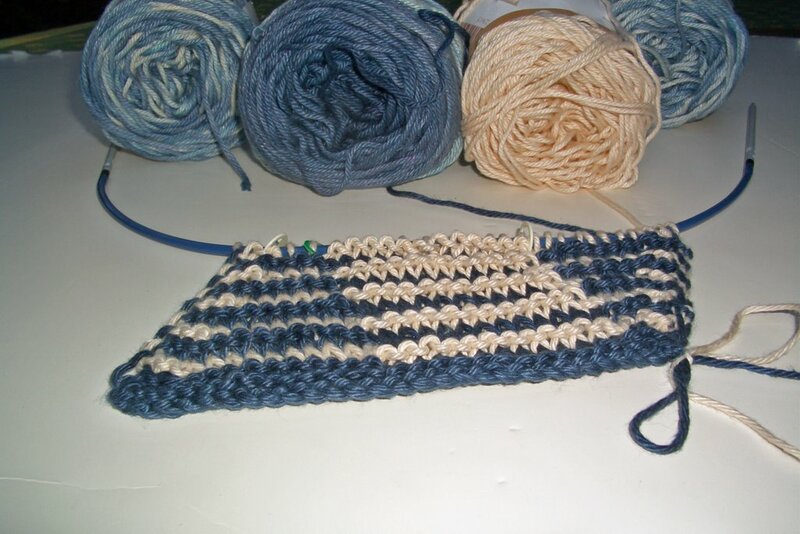 And there is some progress on my shadow knitting...last time you saw this scarf it looked like this. As you can see it has progressed a bit. This shadow knitting takes some thought. I always need to have my little directions near by. 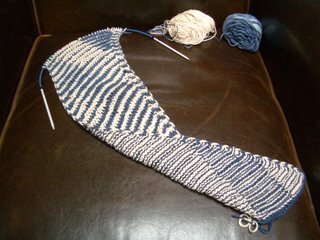 No knitting this scarf while sailing-although I must say the color selection is turning out quite nautical. Hard to believe the dye is called wedgewood blue. I wonder sometimes why I make these things so complicated. On my first real shadow knitting project - - did I really need graduated dyed yarn...did the scarf have to be on a diagonal...did I have to have the shadow stripe circle up the scarf...Ah well...I think it looks pretty cool on both the front and back. I am not sure I like the three stitch straight border on the sides. I may end up removing that and transforming it into fringe. I am trying to figure out if that would wreck the triangular shape of the scarf. I think if I am careful and not pull the yarn too much when I knot the loops it will work out...but I have lots more time to consider finishing as I knit on. Hmmm, maybe you don't want ALL of your scarves fringed. The diagonal shadow spiraling does look cool!